I love this rosary! Its so beautiful! 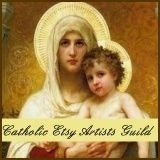 I just applied at Etsy to be in the Catholic Etsy Artist Guild. I really hope I get in!! !